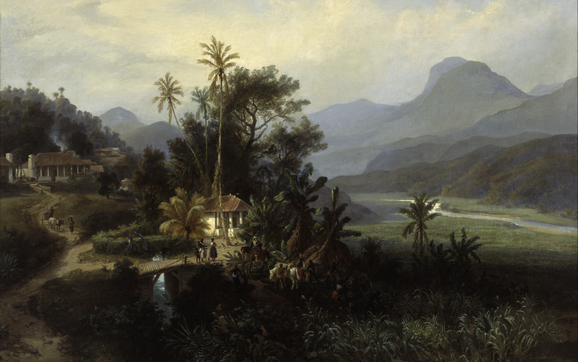 @Visual_ArtsAS OR "Boundless Reality: Traveler-Artists' Landscapes of Latin America from the Patricia Phelps de Cisneros Collection"
This exhibition, jointly presented in two venues, focuses on the genre of Latin American traveler art of the nineteenth century. Auguste Morisot’s 1886 expedition up the Orinoco River serves as the centerpiece of Americas Society’s component of the exhibition, which includes photography, drawings, and prints. Morisot’s archive exemplifies the emergence of photography in the nineteenth century and its relationship to the conventions of painting and representing the exotic landscape. The exhibition is curated by Harper Montgomery, Hunter College’s Patricia Phelps de Cisneros professor in Latin American art, along with Hunter College MA and MFA students. Venues: Americas Society and Hunter College (Bertha and Karl Leubsdorf Art Gallery Hunter West Building. Entrance on 68th Street between Park Avenue and Lexington Avenue). Exhibition General Opening: Friday, October 30 from 12 p.m. to 8:30 p.m. 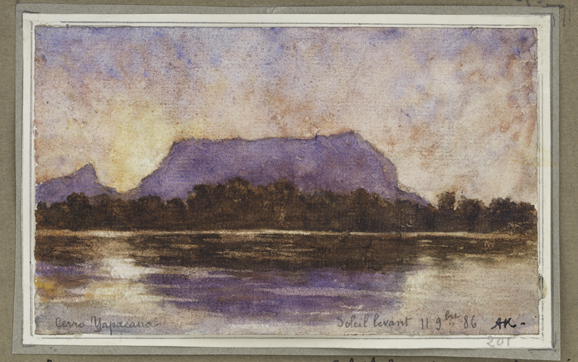 Image: Auguste Morrisot (1857-1951), France, Yapacana Mountain (Rising Sun), 1886, Watercolor on paper. Photographer: Mark Morosse. "At the Sugar Mill," by Ferdinand Bellermann (1814–1889), oil on canvas 1868–70. "Yapacana Mountain (rising sun)," by Auguste Morisot (1857–1951), watercolor on paper 1886. 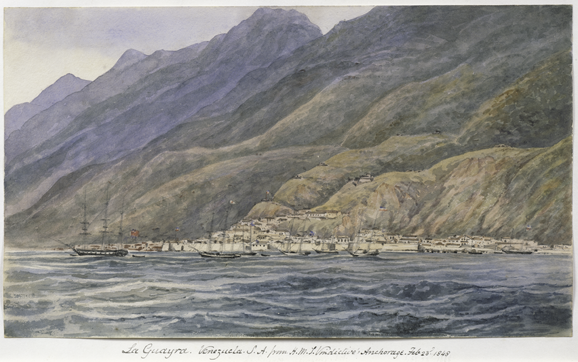 "La Guaira, Venezuela," by Admiral Sir Michael Seymour (1802–1887), graphite and watercolor on paper 1848. 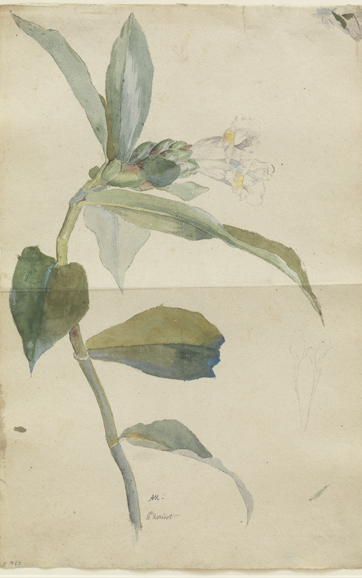 "Costus Scaber Ruiz & Pavon O C. Spiralis," by Auguste Morisot (1857–1951), watercolor and pencil on paper 1886. "Ahuehuete," by José María Velasco (1840–1912), oil on board 1870–75. 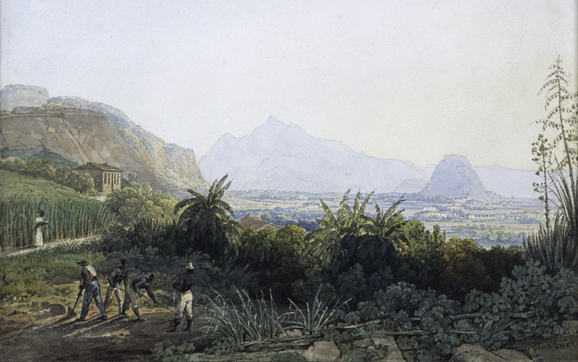 "Rio de Janeiro: View of the Neighborhood of Engenho Velho Drawn from the Austrian Embassy," by Thomas Ender (1793–1875), watercolor on paper 1817–18. The new exhibition on Latin American traveler art is open October 30 to January 23. 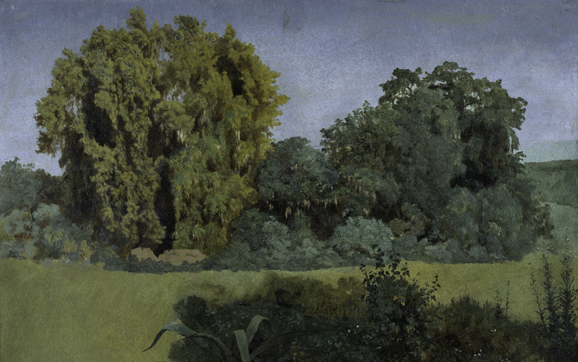 The exhibition Boundless Reality: Traveler Artists’ Landscape of Latin America from the Patricia Phelps de Cisneros Collection is a collaboration between Hunter College, Americas Society, and the Colección Patricia Phelps de Cisneros. The presentation of the exhibition at Americas Society is made possible by the generous support of Mr. Alejandro Bulgheroni and Mrs. Bettina Bulgheroni, Adriana Cisneros de Griffin and Nicholas Griffin, Agnes Gund, The Lauder Foundation – Leonard & Judy Lauder Fund, Mr. and Mrs. Peter and Melanie Munk, Alvaro Saieh B., Alice Walton, and Art Agency Partners. The Fall 2015 Visual Arts program is supported by Jaime and Raquel Gilinski and, in part, by public funds from the New York City Department of Cultural Affairs in partnership with the City Council. Exhibition design and graphics by Project Projects. PHILLIPS is the Lead Sponsor of Americas Society's Visual Arts Program. The Visual Arts Gallery will be open Wednesday through Saturday from 12 p.m. to 6 p.m. Learn more.